If you’d like to repay your federal student loans under an income-driven plan, you need to fill out an application. If you’re seeking Public Service Loan Forgiveness, you should repay your federal student loans under an income-driven repayment plan. How is my monthly payment amount calculated under an income-driven repayment plan? Generally, your payment amount under an income-driven repayment plan is a percentage of your discretionary income . The percentage is different depending on the plan. The chart below shows how payment amounts are determined under each income-driven plan. Depending on your income and family size, you may have no monthly payment at all. How do I estimate my payment amount? Use our Repayment Estimator. The Repayment Estimator provides a comparison of estimated monthly payment amounts for all federal student loan repayment plans, including income-driven plans. This comparison is important because the income-driven plans may not provide you with the lowest payment amount based on your individual circumstances. Your payment may be lower under another repayment plan. To view sample payment amounts, look at the tables below. The following tables provide repayment estimates under the traditional and income-driven repayment plans. These figures are estimates based on an interest rate of 6%, the average Direct Loan interest rate for undergraduate and graduate borrowers. The figures also assume a family size of one, that you live in the continental U.S., and that your income increases five percent each year. Various factors—including your interest rate, your loan debt, your income, and whether (and how quickly) your income rises—may cause your repayment to differ from the estimates shown in these tables. These figures use the 2016 Poverty Guidelines issued by the U.S. Department of Health and Human Services and Income Percentage Factors issued by the U.S. Department of Education. *Loan debt does not include any consolidation loans. How long will I be in repayment under each plan? Income-driven repayment plans have different repayment periods. Under all four plans, any remaining loan balance is forgiven if your federal student loans aren’t fully repaid at the end of the repayment period. For any income-driven repayment plan, periods of economic hardship deferment and periods of repayment under certain other repayment plans will count toward your total repayment period. Whether you will have a balance left to be forgiven at the end of your repayment period depends on a number of factors, such as how quickly your income rises and how large your income is relative to your debt. Because of these factors, you may fully repay your loan before the end of your repayment period. If you’re making payments under an income-driven repayment plan and also working toward loan forgiveness under the Public Service Loan Forgiveness (PSLF) Program, you may qualify for forgiveness of any remaining loan balance after you’ve made 10 years of qualifying payments, instead of 20 or 25 years. Qualifying payments for the PSLF Program include payments made under any of the income-driven repayment plans. Am I eligible for income-driven repayment? Each of these plans has an eligibility requirement you must meet to qualify for the plan. To qualify, the payment you would be required to make under the PAYE or IBR plan (based on your income and family size) must be less than what you would pay under the Standard Repayment Plan with a 10-year repayment period. If the amount you would have to pay under the PAYE or IBR plan (based on your income and family size) is more than what you would have to pay under the 10-year Standard Repayment Plan, you wouldn’t benefit from having your monthly payment amount based on your income, so you don’t qualify. Generally, you’ll meet this requirement if your federal student loan debt is higher than your annual discretionary income or represents a significant portion of your annual income. In addition to meeting the requirement described above, to qualify for the PAYE Plan you must also be a new borrower as of Oct. 1, 2007, and must have received a disbursement of a Direct Loan on or after Oct. 1, 2011. You’re a new borrower if you had no outstanding balance on a Direct Loan or FFEL Program loan when you received a Direct Loan or FFEL Program loan on or after Oct. 1, 2007. This plan is the only available income-driven repayment option for parent PLUS loan borrowers. Although PLUS loans made to parents can’t be repaid under any of the income-driven repayment plans (including the ICR Plan), parent borrowers may consolidate their Direct PLUS Loans or Federal PLUS Loans into a Direct Consolidation Loan and then repay the new consolidation loan under the ICR Plan (though not under any other income-driven plan). No. Under all of the income-driven repayment plans, your required monthly payment amount may increase or decrease if your income or family size changes from year to year. Each year you must “recertify” your income and family size. This means that you must provide your loan servicer with updated income and family size information so that your servicer can recalculate your payment. You must do this even if there has been no change in your income or family size. Your loan servicer will send you a reminder notice when it’s time for you to recertify. To recertify, you must submit another income-driven repayment plan application. On the application, you’ll be asked to select the reason you’re submitting the application. Respond that you are submitting documentation of your income for the annual recalculation of your payment amount. Although you’re required to recertify your income and family size only once each year, if your income or family size changes significantly before your annual certification date (for example, due to loss of employment), you can submit updated information and ask your servicer to recalculate your payment amount at any time. To do this, submit a new application for an income-driven repayment plan. When asked to select the reason for submitting the application, respond that you are submitting documentation early because you want your servicer to recalculate your payment immediately. Under these plans, your monthly payment amount will be based on your income and family size when you first begin making payments, and at any time when your income is low enough that your calculated monthly payment amount would be less than the amount you would have to pay under the 10-year Standard Repayment Plan. If your income ever increases to the point that your calculated monthly payment amount would be more than what you would have to pay under the 10-year Standard Repayment Plan, you’ll remain on the PAYE or IBR plan, but your payment will no longer be based on your income. Instead, your required monthly payment will be the amount you would pay under the 10-year Standard Repayment Plan, based on the loan amount you owed when you first began repayment under the PAYE or IBR plan. Even if your income continues to increase, your monthly payment will never be more than the 10-year Standard Repayment Plan amount. During any period when your monthly payment is not based on your income, you still have the option of recertifying your income and family size. If you recertify and your income or family size changes so that your calculated monthly payment would once again be less than the 10-year Standard Repayment Plan amount, your servicer will recalculate your payment and you’ll return to making payments that are based on your income. Under the REPAYE and ICR Plans, your payment is always based on your income and family size, regardless of any changes in your income. This means that if your income increases over time, in some cases your payment may be higher than the amount you would have to pay under the 10-year Standard Repayment Plan. What types of federal student loans can I repay under an income-driven repayment plan? The chart below shows the types of federal student loans that you can repay under each of the income-driven repayment plans. *If a loan type is listed as “eligible if consolidated,” this means that if you consolidate that loan type into a Direct Consolidation Loan, you can then repay the consolidation loan under the income-driven plan. For example, only Direct Loans may be repaid under the REPAYE, PAYE, and ICR plans. However, if you consolidate a FFEL Program Loan or Federal Perkins Loan into a Direct Consolidation Loan, you may then be able to repay the Direct Consolidation Loan under the REPAYE, PAYE, and ICR Plan (depending on the type of loan that you consolidate). Note that consolidation is not the right choice for all borrowers or all loan types. In particular, you may lose certain loan benefits if you consolidate a Federal Perkins Loan. Find out more about loan consolidation. Only federal student loans can be repaid under the income-driven plans. Private student loans are not eligible. Is an income-driven repayment plan right for me? Income-driven repayment plans usually lower your federal student loan payments. However, whenever you make lower payments or extend your repayment period, you will likely pay more in interest over time—sometimes significantly more. In addition, under current Internal Revenue Service (IRS) rules, you may be required to pay income tax on any amount that’s forgiven if you still have a remaining balance at the end of your repayment period. How do I decide which income-driven repayment plan to choose? If you’ve decided that an income-driven repayment plan is right for you, you’ll want to choose the plan that provides the most benefit to you based on your individual circumstances. Although all four income-driven plans allow you to make a monthly payment based on your income, the plans differ in terms of who qualifies, how much you have to pay each month, the length of the repayment period, and the types of loans that can be repaid under the plan. If you have only Direct Loans, you can choose from all four income-driven repayment plans. If you’re not sure which plan to choose, you have the option of requesting the income-driven plan that provides the lowest payment amount. Your servicer will determine which plans you qualify for and will then place you on the plan with the lowest monthly payment. If you have FFEL Program loans, your only income-driven repayment plan option is the IBR Plan. However, if you consolidate your FFEL Program loans into a Direct Consolidation Loan, you’ll then have access to the REPAYE, PAYE, and ICR plans. Find out more about loan consolidation. Before you apply for an income-driven repayment plan, contact your loan servicer if you have any questions. Your loan servicer will help you decide whether one of these plans is right for you. To apply, you must submit an application called the Income-Driven Repayment Plan Request. You can submit the application online at StudentLoans.gov or on a paper form, which you can get from your loan servicer. The application allows you to select an income-driven repayment plan by name, or to request that your loan servicer determine what income-driven plan or plans you qualify for, and to place you on the income-driven plan with the lowest monthly payment amount. When you apply, you’ll be asked to provide income information that will be used to determine your eligibility for the PAYE or IBR plans and to calculate your monthly payment amount under all income-driven repayment plans. This may be either your adjusted gross income (AGI) or alternative documentation of income. your current income isn’t significantly different from the income reported on your most recent federal income tax return. Apply using the online Income-Driven Repayment Plan Request and use the IRS Data Retrieval Tool in the application to transfer income information from your federal income tax return. Use the paper Income-Driven Repayment Plan Request and provide a paper copy of your most recently filed federal income tax return or IRS tax return transcript. If you currently receive taxable income, you must submit a paper Income-Driven Repayment Plan Request with alternative documentation of your income, such as a pay stub. If you currently don’t have any income or if you receive only untaxed income, you can indicate that on the online or paper application. In this case, you’re not required to supply further documentation of your income. What other options do I have if I need help repaying my student loans? If an income-driven repayment plan isn’t right for you, contact your loan servicer to discuss other repayment options. You may be able to extend your repayment period through the Extended Repayment Plan or through loan consolidation. You may also be able to temporarily suspend repayment through a deferment or forbearance. Where can I learn more about the income-driven repayment plans? Want more information about the income-driven repayment plans? 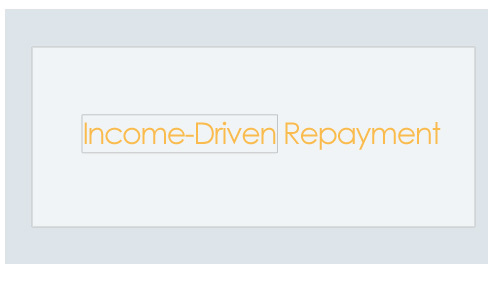 Browse the Income-Driven Repayment Plans: Frequently Asked Questions.